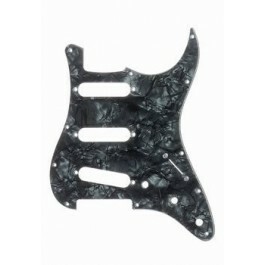 Allparts 3 Ply Dark Black Pearloid Pickguard for 3 single coil guitars (Dark Black Pearloid, Black, White). - USA/Mex Series Screwhole Spacing. - Pickguard Screws sold separately. Note: Not all pickguards are created equal. Most 'import' pickguards have 8mm holes for smaller metric pots, and some are close, but not 'quite' the right shape when compared to USA pickguards. 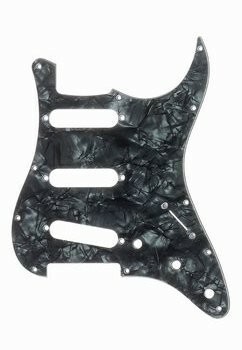 Cheaper Import pickguards usually have different pickup rout positioning (especially the bridge pickup) and screwhole spacing, which does not match USA/Japan Specs.